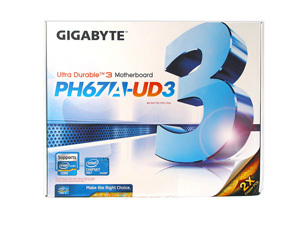 Today we're taking a look at GIGABYTE's PH67A-UD3 motherboard, the first of many Intel Sandy bridge (LGA1155) motherboards that are sure to come across our test bench in the very near future. 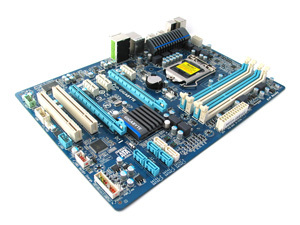 So let's get started and see what this value-orientated motherboard has to offer! 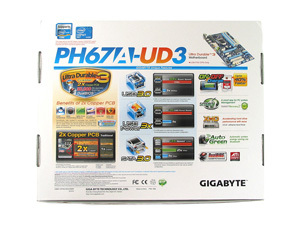 The PH67A-UD3 supports the latest dual and quad core Intel Sandy Bridge processors. 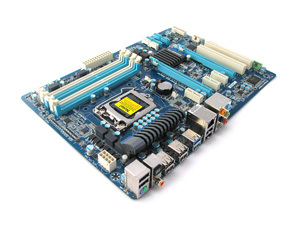 It features six SATA ports (two SATA 3.0, four SATA 2.0) with RAID 0, 1, 5 and 10, four DDR3 memory slots, NEC's SuperSpeed USB 3.0, Realtek Gigabit LAN and two PCI-Express x16 slots, allowing for 2-way CrossFireX support. Measuring in at 30.5cm x 21.5cm, it conforms to the normal ATX Form Factor. In the box we find one set of SATA cables (2 cables in total), multilingual installation instructions, a software/driver CD, as well as a user manual and I/O panel. The bare essentials required to get you up and running. 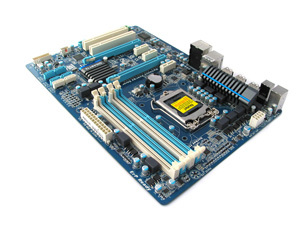 Below you can find a generic Intel H67 chipset diagram. As you might have heard, the Intel H67 chipset has some limitations that can be reflected in the products on the market and their price-points. 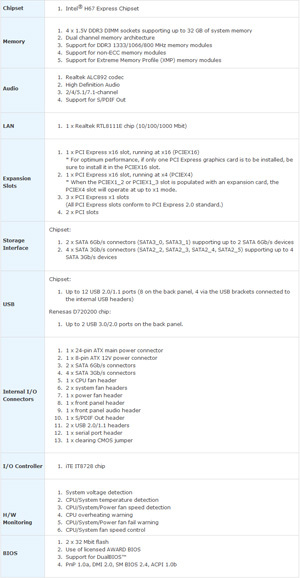 Some of the key limitations include no ability to overclock even the fastest K-series processors, a limit of 1333MHz on the memory, PCI-Express speeds to x16 for a single card (which is fine in itself), while the second card (if you choose to use it) feeds off the Intel Southbridge for bandwidth at x4. With those limitations, it does offer one unique feature that is not present in the performance based P67 chipset, it allows for video output (where implemented) thanks to the integrated GPU in the processor itself. 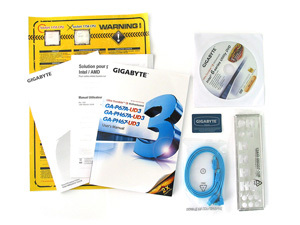 The GIGABYTE PH67A-UD3 includes a full array of connections including eight USB 2.0 ports, two USB 3.0 ports with blue highlights, a combo PS2 keyboard and mouse connector, gigabit Ethernet connectivity via the onboard Realtek chip, as well as one coaxial and optical S/PDIF connector and a set of six analogue 3.5mm outputs. 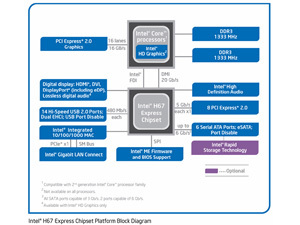 Notably absent are any display outputs commonly found on Intel H67 chipset implementations. 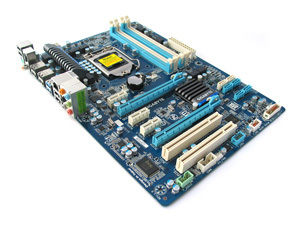 The motherboard's design is in line with what you might expect at this price point. 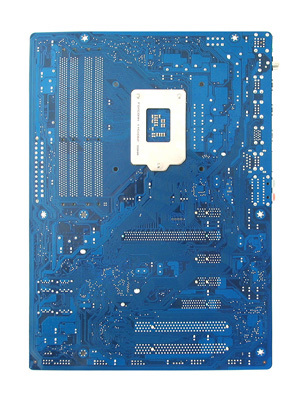 The back side of the motherboard is clear and tidy without any protruding screws or heatinks, while the face of the board maintains external power, USB and audio headers in easy to access areas. 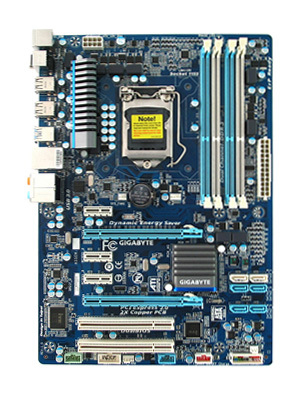 It also continues GIGABYTE's familiar blue colour scheme, leaving the black PCB design to the performance/enthusiast segment.